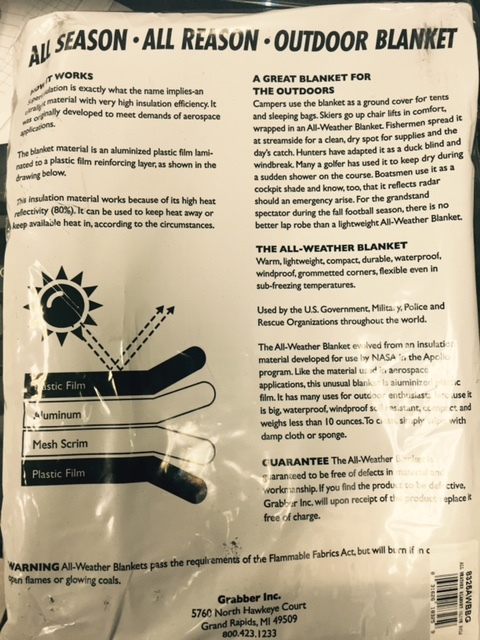 Heavy Duty Reflective Rescue Blanket that doubles as an emergency tarp. Lightweight SUPER insulator for warmth and protection. Army Type Olive Drab Aluminized Casualty Rescue Blanket . Technology and materials originally developed for use by NASA in the Apollo program. his is no throw away -- it is very strong but reasonably light weight ( ~ 10 ounces ). One side is olive drab for stealth, other side is highly reflective surface to reflect body heat back to you. When used as a day time shade tarp - the reflective side can be used to reflect sun heat away from you providing life saving shade and reflecting the mid day heat away. Flip it over at night to conserve warmth. Corners have metal grommet holes to stake out as a floor or in a tent or for ropes and tarp deployment. The blanket material is a reflective aluminum film laminated to a mesh scrim reinforcing layer. Both those layers each covered by a plastic protective film. The result is a flexible, durable, waterproof product. The reflective side reflects back 80% of the heat permitting it to keep heat IN or keep heat OUT - depending on your needs. Waterproof, Windproof, Soil Resistant heavy duty construction. ***Gaurentee: All Weather Blanket is guaranteed to be free of defects in material and workmanship. Click the button below to add the ALUMINIZED CASUALTY BLANKET- All Weather Space to your wish list.